This Tomorrow Sleep mattress review highlights this new luxury hybrid coil / foam mattress that recently hit the market from the makers of Serta / Simmons. Its founders have brought the cumulative years of experience that Serta / Simmons has in the mattress industry to the market with an integrated set of sleep products that includes a hybrid mattress, bedding, pillows, a sleep tracker, and more! The idea behind this mattress was to incorporate the deep experience Serta / Simmons has in the mattress industry to developing a direct-to-consumer mattress and integrated accessories that offer comfort and support, and quality at a fraction of the cost of in-store mattresses. The Tomorrow Sleep mattressis a 10″ hybrid pocketed coil and foam mattress made up of 4 layers. It comes in 2 firmness options, Medium Soft and Medium Firm, of which we tested the Medium Soft mattress. 1″ Comfort Layer – This layer is 1″ of 4.8lb Visco Elastic memory foam infused with phase-change temperature regulating material. This layer provides the initial comfort and body hug along with cooling and heat dissipation via the phase-change material. 2″ Support / Cooling Layer – This layer is 2″ of 2.5lb gel infused memory foam that provides cooling and support along with the top comfort layer above. 6″ Support Layer – This layer is made up of 6″ of pocketed innerspring coils which provide the primary support and aids in cooling and comfort. In addition, this layer also has a 3″ thick ventilated side rail system that contains the coils and helps with airflow through the sides of the mattress for additional cooling. 1″ Foundation Layer – This layer is 1″ of high density base foam that acts as the foundation for the coil system. The difference between the two firmness options are a thinner layer of the gel-infused memory foam in the support layer (.5″ vs 2″) and the inclusion of a 1.5″ layer of “bounce foam” beneath it, along with a firmer top 1″ comfort layer on top. The cover of this mattress contains phase-change temperature regulating material which helps transfer heat away from the body when hot, and retain heat when you are cool. This material is found in a few of the mattresses we have tested, and it really does work. The cover has a nice pattern on it that feels nice when next to your body, and it also aids in comfort and airflow. This model comes in two firmness option, medium soft and medium firm. We tested the medium soft model, which we rate it at a 5-6 out of 10 (10 being the firmest). It feels like a true medium firmness mattress, in that the top comfort layer provides a soft, luxurious feel with the underlying coils and foam providing good support underneath. With many mattresses, since I am a heavier sleeper, I tend to press through the top comfort layers and feel more of the support layers which are often harder and not as comfortable. Even though it is only 10″, this did not happen in my case which pleasantly surprised me. The hybrid coil construction provides a good degree of support for my heavy 230lb frame, and instead of coming to rest on a hard foam core like other 10″ foam mattresses have caused me to feel, the Tomorrow Sleep pocketed coil hybrid design supports my bodyweight nice and comfortably. The Tomorrow Sleep mattressreally provides the degree of support a heavier sleeper like myself needs from the pocketed coil foundation layer combined with the top comfort layers, and as stated – is really surprising considering it is only a 10″ mattress. In terms of support, we felt the Tomorrow Sleep mattress does a really good job of providing excellent support in all sleeping positions for both Kaye and myself sleeping as a couple. 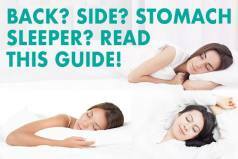 As we are primarily side sleepers, we like mattresses that provide enough give in the top comfort layer to support our shoulders and hips, while also having the firmness if we switch to our stomach or back. 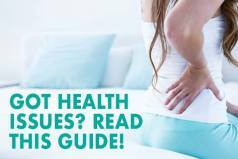 It definitely provides the support for our shoulders and hips via the layer of coils that provide the support in these areas that we need the most. The Tomorrow Sleep mattress is quite comfortable, with the expected bounce and responsiveness coming from the coils combined with the gel memory foam top layer providing good body contour and hug. The coils helped provide the bounce needed to switch positions during the night and supported my heavy bodyweight with ease, without causing too much movement during the night for Kaye when I got up or moved around. We feel this model does a great job at providing comfortable sleep in all sleeping positions, and the soft cover makes for a very supple sleep surface with the phase-change material helping keep the mattress cool. This mattress is both very supportive as well as being a very comfortable mattress, and the premium materials all lend themselves to accomplishing this. The Tomorrow Sleep mattress does a good job of not sleeping hot due to the gel foam layer in the top comfort layer, combined with the use of phase-change material in the covers as well. As a rule, hybrid coil mattresses tend to sleep cooler due to the nature of innerspring coils allowing for good airflow throughout the mattress. The Tomorrow Sleep also incorporates perforated edge panels around the individually wrapped coils, which also helps aid in promoting airflow and circulation throughout the mattress. Taken together, all of this technology does a great job of keeping the Tomorrow Sleep mattress quite cool, and we thankfully did not experience the sticky feeling that we often do with foam mattresses. This mattress does a good job with minimizing sinkage, which surprised me quite a bit given that it is only 10″ in height. As we always preach, sinkage (and motion transfer) is largely weight dependent. With the Tomorrow Sleep, I did compress the mattress quite a bit when sitting up, as my heavy weight tends to do that – however, I did NOT come to rest on our foundation below the mattress, which almost always happens with 10″ mattresses. The support coils kept this from happening, which was quite a welcome surprise. When lying on the mattress and switching positions, I didn’t sink down noticeably either. Which is good. In addition, Kaye did not “roll into me” which she often does with less supportive 10″ mattresses due to our weight disparity. Edge support is very good with this mattress, and better than many mattresses we have reviewed. The inclusion of the edge support layer in the construction of the mattress does a good job at providing even support throughout the mattress, especially the edge. I slept near the edge at time to test this and did not experience any of the “rolling off” the edges or having them compressed under my weight. Motion transfer is, however, a little bit more than most memory foam mattresses we have reviewed, as to be expected with a hybrid coil mattress which provides more bounce than an all foam mattress due to the innerspring coils in its construction. Our review of this mattress gets high marks in this category for not having a noticeable smell upon opening the box. The hybrid coil / foam construction minimized the degree of off-gassing that all foam mattresses usually have. Tomorrow Sleep offers many of the same features as other online mattress retailers, with one big caveat – they are backed by Serta / Simmons so you know the company isn’t going anywhere soon and can honor their warranty and provide excellent customer service as to be expected by a company with their 100 year plus history in the mattress industry. This model is very reasonably priced, coming in at $865 for a Queen, after clicking here and using our $125 off code: MFT125 . This is a really good price given the quality materials and construction used in this mattress. The Tomorrow Sleep mattress is a great hybrid coil / foam mattress that provides the benefits of both innerspring mattresses and memory foam mattresses as well, all wrapped up with high quality materials and excellent craftsmanship which make it truly a luxury hybrid mattress that can compete with other beds costing much more. This mattress provides a good medium soft firmness with good support for all sleeping styles, and provides a good degree of bounce and responsiveness from the coil hybrid design. While this makes the mattress have a small amount motion transfer, this is to be expected for these type of designs. It sleeps rather cool and has great edge support as well, which all lend to it being a great mattress for couples as well as those that like the bounce of innerspring mattresses and the hug and contour of foam. We feel that the team behind Tomorrow Sleep really got things right with this mattress, has delivered a luxury hybrid mattress that delivers the best of both worlds – innerspring technology combined with the benefits of memory foam. What is even better is the entire sleep ensemble that Tomorrow Sleep has to offer as well – which we are huge fans of – their bedding, pillows, sleep tracker, and other accessories all work together to provide an unparalleled sleep environment. 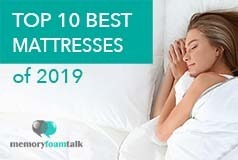 If you are looking for a comfortable and affordable hybrid mattress, you can’t go wrong choosing this mattress, which we really enjoyed and highly recommend so much that it is our favorite hybrid coil mattress and one of our Top 10 Best Mattresses. We hope this review helps in your next purchase decision. Do we need to also buy boxsprings and does a king use standard king sheets? Read the full Tomorrow Sleep vs. Brentwood Home Oceano comparison. Read the full Tomorrow Sleep vs. DreamCloud Sleep review. In this review, we will be comparing two hybrid mattresses coming from two popular online mattress retailers Tomorrow Sleep and Helix Sleep. Read the full Tomorrow Sleep vs. Helix comparison. Click here for more Tomorrow Sleep mattress comparisons.